So I’d like to add more plant litter such as leaf litter, bark and grasses to my hermit crabs diet. What do you guys think about going to the woods and just like, grabbing up a bunch of loam off the ground? I’m also considering going to a wild field and just clipping a bunch of grass / plants and letting them dry out and adding them. Can anyone see any problems with this plan? I picked up a bunch of stuff off the ground once, and then when I got home I worried about whether it had started to grow mold and spores and stuff. So the next time I collected leaves, I took ones that were dried up (it was fall here) but hadn't actually fallen onto the ground yet. Dried them out completely, scrunched them up, and have a big zip loc bag in my freezer for the winter! I made a mix of grape, raspberry, oak, elm, and maple leaves. I got them at my sister's farm (the home yard), which is away from any crops etc that would have been sprayed. My yard is surrounded by crops that are sprayed, so I don't take the leaves from my yard. Yeah I was thinking I’d leave everything to dry in the sun. I bet the crabs would love some forest dirt! 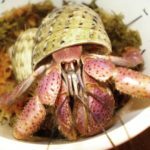 It won't be harmful to the crabs in any way and can provide for a very robust bioactive environment, but you could be bringing in who-knows-what. I know that bothers some people a lot! I've had random spiders and beetles and moths pop out of collected items. All types of springtails and thrips and fungus gnats, and even a nice selection of beneficial mites. I never cared myself, and just toss stuff in the tank. Because these are native creatures and because there are bound to be eggs, simple freezing or heat can end up not being enough. Deep freezing at least -1 or lower for a month can work wonders on wiping out problems before they start, but it will be brittle when frozen and you can end up with pulverized mulch if you aren't careful. Boiling for five minutes (longer for branches or anything thick) will also work but you'll lose tannins and end up with a mushy end result like a used tea bag. Baking at 225 for a while will also kill off anything, but then you end up with house that smells like burning collectibles and they'll be extremely brittle from the dryness. A dehydrator set on low for two days is usually enough to dry out any insects or eggs, but they'll vacate the dehydrator while this is happening so it should be done in an area where it's okay that they escape. And of course there's limited space on the racks so big items are a no-go. bugs don't bother me that much either. ill probably poke through it a little to get rid of anything really big. i cant wait till i can go and get some loam to feed for my crabs!